I have just hung one of the largest pieces of commissioned work I have ever done before! They are matted and framed 24″ x 36″ with the drawings at 20″ x 30″. Yikes! It is being hung in the Conference Room. This room is available for community use. They are front and center in the room. 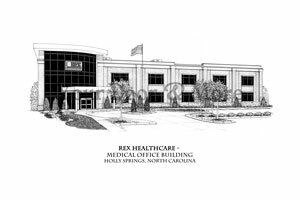 Rex has been in the Holly Springs area but by making a commitment to Holly Springs, they have hoped to create a relationship with the residents and the leaders of Holly Springs. As residents, we have very little health care facilities. The building will house an urgent care and various medical offices. The State of North Carolina has recently granted the awarded the right to build a Hospital. The plans are to start construction in late 2012. They have purchased this through the Holly Springs Arts Council. The HSAC will receive 25% of the proceeds and Rex purchased this as a tax-deductible donation. A win-win situation for all! Stop in any time and take a look!